The baptism of a child (sometimes called christening) is always a wonderful occasion in the life of a family. It is a time of joy and thanksgiving for a safe delivery and for the gift of new life, and an opportunity to pray for God’s blessing on the child in the years ahead. Baptism marks the beginning of a child’s journey of faith within the Christian community, leading in later years, we hope, to confirmation and active adult membership in the Body of Christ. The journey of faith is one of growth, discovery, and transformation, as we mature into the people God created us to be. One of the most important things in our lives is water. Without water to drink, we would die; without water to irrigate plant life, there would be no food in the world; without water to wash ourselves, life would be miserable. We are born from the waters of our mother’s womb. Water is thus not only a symbol of life: it is a source of life, an essential and precious gift. Baptism is a ritual and symbolic washing by which we are cleansed and reborn. Sharing in the death and resurrection of Christ, we are born into his world-wide family the Church. Promises are made, the child is signed with the cross in token of our discipleship of Christ, and at the end of the service, a special baptism candle is lit for the child to remind us that we are called “to shine as a light in the world to the glory of God the Father”. Baptism is an occasion rich in meaning and symbolism. If you live in St Mary’s parish, or worship with us on a regular basis, we will be delighted to discuss with you the possibility of your child being baptised. The ceremony can take place either in the context of the Parish Eucharist when the whole congregation is present, or on a Sunday afternoon with just friends and family present. Whatever option you choose, we want it to be a special occasion for you as you celebrate the gift of your child. 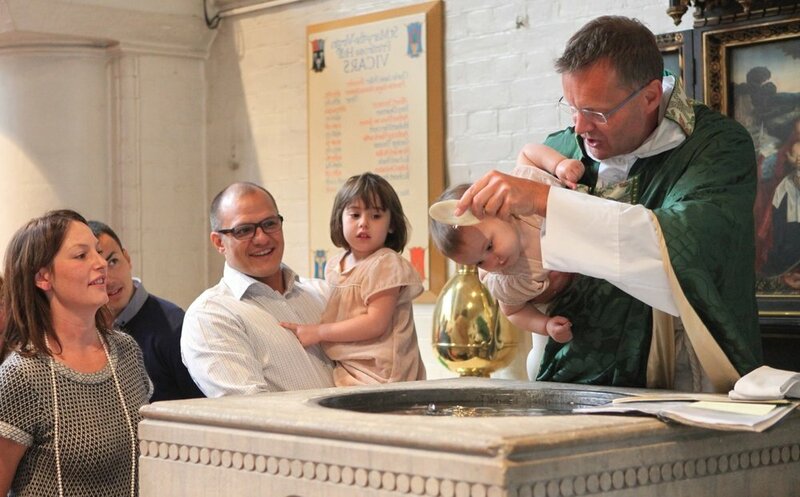 For more information regarding 1st time baptisms please visit Church of England Christenings.